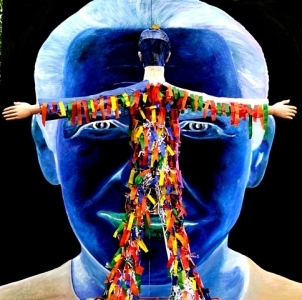 Toym Imao is a distinguished trailblazer in the field of Philippine art. A scupltor and painter, Toym, as he is known to friends, has a huge, ever growing sculptural portfolio. Recognized for his provocative sense of aesthetics, Toym has received many awards, among them the top prize of the Instituto Cervantes’ letras y figuras competition and the Remy Martin National Mural competition. Toym's workscan be found in numerous locations in the Philippines, in many Philippine embassies abroad and in localities such as Los Angeles, California and Vietnam. Evident in Toym's historical renditions is the depth of the research that goes in his creations. A voracious reader and an avid researcher, Toym takes particular delight in ferreting out little known facts and incorporating them in his sculptural reliefs like The Andres Bonifacio National Shrine, The Dagohoy Rebellion, The Moro Wars, The Battle of Quingua, Battle of Mabitac, to name a few. Toym was recently chosen as a Fulbright Nominee for 2010. Desparecidos: Memorializing Absence, Remembering the Disappeared. Desaprecidos: Memorializing Absence, Remembering the Disappeared.